Find People Fast! Software Includes: Master Resell Rights ! If you've used the Internet much, you've undoubtedly tried to look up someone using one of the many websites that allow you to enter a person's name and city then perform a search on their database of information. If you've done this type of search, you've probably been disappointed in the results generated. The problem is, nearly every people-search website uses a different source of data for their information. Sometimes their data is incomplete or out of date. 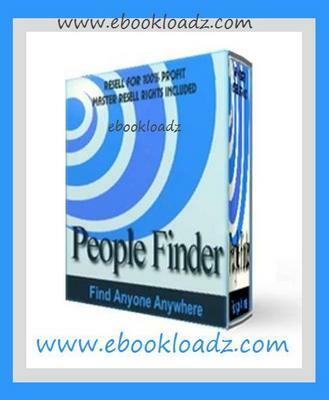 As a result of the authors own frustration with trying to find an address or e-mail of a friend, People Finder was put together as a, easy to use software application that searches eight of these people-search websites at the same time! The program is quite simple. You simply fill in as much information as you have on the person you are trying to look up, click "Search" and this information is submitted to each website. You can then go through the information returned by each website to see which is most useful. This New Product Now Comes with Master Resell Rights So you can resell it and keep 100 $$$ of everything you make!